If that isn't the perfect woman, I don't know what is. Gotta break those new leathers in before Sunday. See ya @ the track! Not so much cooking but she lets me go out to eat. I do most of the cooking around here. 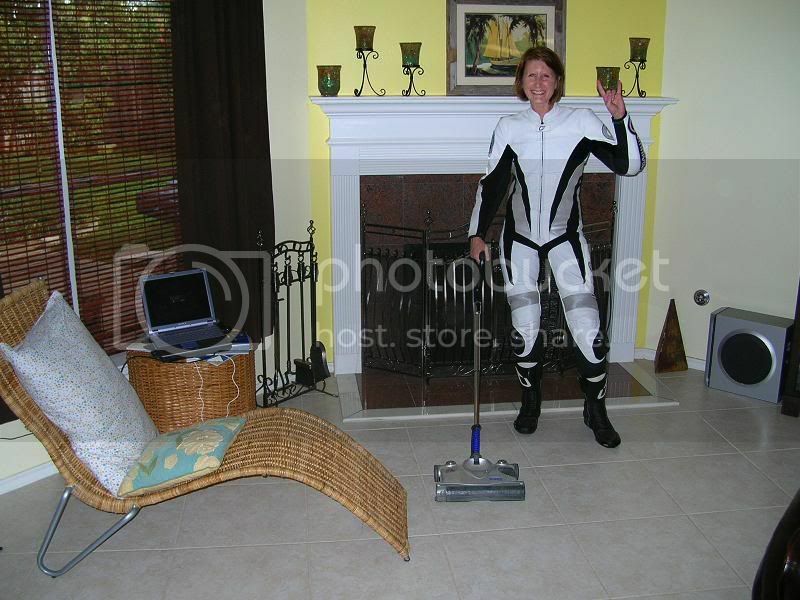 you don't need to lose any weight, but I bet you could doing the housework in full leathers LOL. They look great BTW. I have a maid from "Nekkid Wimmins Cleaning Service" come in twice a month to do the heavy duty cleaning. The buffin and polishin , the heavy duty stuff, hum, how U get her to agree to dat? Run around the block a couple of times at about 3pm when the sun is the hottest, that'll break em in. 2013 Suzuki V-Strom 22,000 miles.U.S. : AL, AK, AZ, CA, CO, FL, GA, ID, KS, LA, MS, MT, NV, NM, NC, OK, OR, TN, TX, UT, WA, WY. Canada: AB, BC, YT. lol....yup that should do it. That's what I told her. Get out and run around the block a few times. Work up a good sweat and then go ride the bike. Voila! Yeah, I saw you at Deerbrook mall about the 30th of May or so. SassyChassis, you gotta break them leathers in somehow. Tiller , you lucky dog!! Riiigghht! She'll come home and pass out and that will be the end of her day.